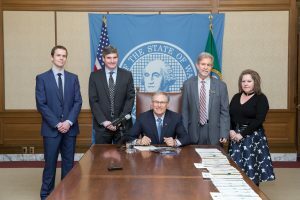 On March 22, 2018, Governor Inslee signed into law HB 1336. Prior to HB 1336 becoming law, all workers receiving both workers’ compensation benefits and social security retirement benefits were subject to having their workers’ compensation benefits reduced based on their receipt of social security benefits. HB 1336 will make it so that individual injured after the effective date of the statute, June 8, 2018, will not be subject to this reduction in their benefits. This bill, originally drafted by David Lauman, took three years to get passed. The Washington State Association For Justice and the attorneys from our firm worked very hard to lobby the legislature to get this bill passed into law. Gov. Inslee signs House Bill No. 1336, March 22, 2018. Relating to the social security offset to disability compensation.